Yes, that's me. Dressed for senior team photo (left). And, game shot (right) ... even had my head up! 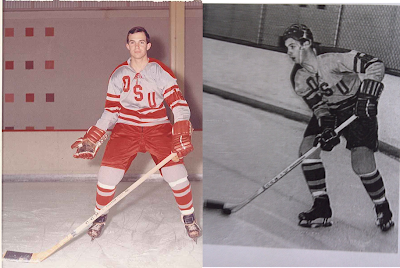 A quote in a St. Louis Post-Dispatch column on St. Louis Blues coach Ken Hitchcock caught my eye and reminded me of the lessons I learned while playing varsity hockey at Ohio State. And, since the NHL playoffs are beginning, it seems appropriate to talk about the lessons hockey provides association management. "There comes a time when you have to make a decision whether you're going to coach people that play hockey, or you're going to coach hockey," Hitchcock said. "And there's a difference. I enjoy people as much or more than I do the game. I'm not a hockey junkie. I am a people junkie. I love working with people. For me my focus here from Day One was coming in and enjoying people. Because I don't know how much longer I'm going to be able to do this." 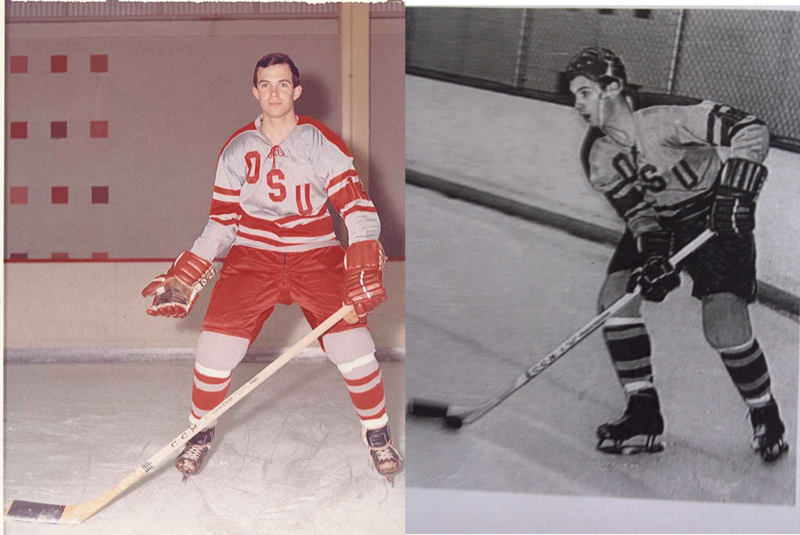 I learned to play ice hockey on a farm pond and ended up playing varsity hockey at Ohio State. My first coach was an “old-school” hockey teacher from Canada. It didn’t take him long to learn that I wasn’t schooled in hockey knowledge (or talent!). During one practice he shouted “Drake, you would be a better hockey player if you were more mobile, agile and hostile.” I’ve not forgotten his words (with a Canadian accent) and, as you see below, feel that they apply to association management. Work with people. Hockey is a team sport. Not just players but also coaches, trainers and management. You need to create an environment that gives each person the ability to do their best. You need to know how to motivate different personalities. You need to ensure that each person on the team knows his or her role. Associations, of course, require a full range of people (both paid and volunteer) to achieve their objectives. Board and committee members. Management and professional staff. The organization’s success depends on them knowing their roles and working together to achieve the common goals. Mobile. As my old hockey coach urged, you need to be quick, loose, free, movable, able to change rapidly and adaptable. Aren’t these the attributes we need to succeed in the rapidly changing environment in which our association’s operate? Agile. My coach wanted me to be nimble, ready, rapid, alert, energetic and spirited. Again, great attributes for people working in associations. Hostile. Finally, my coach wanted me to be disciplined and to focus on the mission without deviating from the overall objective. (He probably also wanted me to be tougher and more aggressive!) Again, as association leaders, we need to have the discipline needed to focus on mission and objectives. Changing on the fly. Because of the huge amounts of energy and the limited stop in play, hockey teams often change lines (players other than the goalies) on the fly. If you watch, you’ll see forwards and defensemen change while the play continues. This provides “fresh” players to keep the game moving. Sometimes, associations need to change on the fly too. It might be a “hot issue” or a negative story in the media that demands immediate action. You need to act quickly and perhaps even change “players” for short periods of time. Mix & match. Hockey coaches switch players during the game to get the most from all. Sometimes it is because of the other team’s players. Sometimes because you are short-handed (one or more players in the penalty box) or because you are on a power play (the other team has one or more players in the penalty box). And, sometimes a player just isn’t having a good game. The same thing applies to association management. You need a team willing to pitch in whenever, however and wherever needed. And you need to instill this spirit in your organization at all levels. Competitive will to win. As a hockey team, you play to win. To get to the playoffs. To win championships. Some people today feel competition is negative. My experience in team sports, however, gave me the determination to be successful. Whether recruiting members, seeking donors or advocating our cause, associations and nonprofits operate in a competitive environment if only that we are competing for the time and money of our members, donors and prospects. Our staff and volunteers need to feel this if our organizations are to succeed. Take time to celebrate. When a hockey player scores a goal, he raises his stick and his teammates have a “hug fest” in celebration. When you win a game, players celebrate and thank their goalie. When you win a tournament series, the teams shake hands. When associations fail to celebrate, they miss a great opportunity to boost morale and reinforce positive lessons. Hockey ... a great sport offering valuable lessons for association management professionals. If you’ve played a team sport, I’d enjoy hearing lessons you learned that I missed. Just log them into the comments. Thanks. Steve, as a big hockey fan (Go Rangers! ), I really appreciate this post. You may want to check out a post I wrote back in 2007 that uses hockey as a metaphor. Thanks Jeff, I will. Hey, maybe the STL Blues will meet the Rangers this year for the Cup?? As a hockey player / coach and Association Professional I learned a number of these lessons. Great article!